Scholars opine music could be a gift by the gods to mortals. Ravana’s legend says King Ravana had associated with immortals and music is one thing they gifted him besides power to be airborne. It is said in Buddhist history; Lord Buddha had listened to Pansilu’s Veena music recitals once and commended him. The divine aspect of music is shed light upon by a rare breed of musicians in the world from time to time, something laymen can only enjoy but never have the capacity to define with mere words. Dinesh Subasinghe is a young musician who came to limelight with ‘Rawanahatha’ musical instrument some years back. Inclination to music came to Dinesh from his bloodline. His father who had been a member of the Navy band in 1970s was related to B A W Jayamanna, elder brother of Eddie Jayamanna. Dinesh had learned finer points in music from the veteran B Victor Perera. The maestro had taught his last music lesson to Dinesh prior to the day he bade adieu to mortal life. Association with world renowned musicians like Maestro Premasiri Khemadasa and Indian musician A R Rahman added immense value to his vibrant melodious career. Dinesh’s innovations in music with Ravanahatha were reckoned in the international sphere too. In the local context, composing touching music scores for Wariga Pojja and Ho Gana Pokuna cinemas positioned him as a young and resourceful musician who makes haunting music scores that exceed the limits of vocals. Dinesh also has in his kitty a range of stage drama and tele-drama music directions done by him. His tele-drama music direction stint commenced with Chandraratna Mapitigama’s ‘Hummanaya’ in 2003. 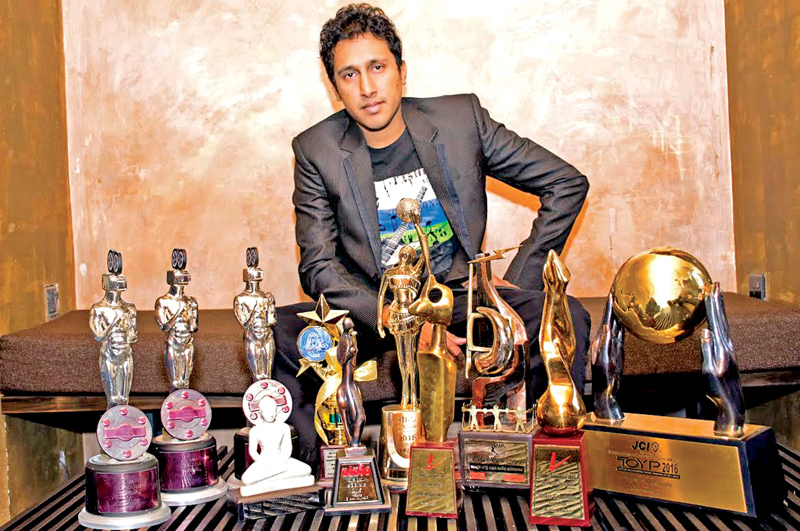 Dinesh has so far composed music for 75 tele-dramas which is a new record. In his latest interview with the Daily News T&C Dinesh told music has a healing power and he intends to explore into grasping spiritual facets in music. You have added more value to your awards galore lately. Winning five awards for making music scores for ‘Ho Gana Pokuna’ and the TOYP award in 2016 is significant in my music career. The TOYP award is given annually to ten outstanding young persons of the world. In 2016 I was awarded for my contribution to Sri Lankan Arts. After the stint with A R Rahman you move into film music scoring. Yes. However it was not a bed of roses. I sweated a lot to entice local film directors with my work. I used to show them pieces of music I composed for Passion Plays in Duwa, Negombo. You have made music scores for 75 tele-dramas to date. This is a record. Your comment? I happen to be the youngest amongst seniors Maestro Khemadasa, Dr Rohana Weerasinghe and Navaratna Gamage to achieve such a feat. I have so far worked in 146 teledramas as an instrumentalist and made tunes for 75. Further I have contributed as an instrumentalist to 47 films and composed music for 12 films and 20 stage plays. At the inception of your career you did a CD with the instrument Ravanahatha. Why were you so passionate towards this ancient musical instrument? My first solo album was ‘Ravan Nada’ in which I brought to fore sounds of the Ravanahatha instrument. I made an instant liking towards this instrument given to me by a friend and developed it further to play in many forums here and abroad. Even Indians have their version of this instrument and they too call it Ravanhatha. There exists a long history associated with this instrument. The Ravanahatha was played in Hrithik Roshans movie ‘Mohenjo Daro’ in which A R Rahman did the music. I believe King Ravana was someone who stood for humanity, no matter whether he was just a myth or a real being. You seem to possess a lot of knowledge on religions, doctrines, and philosophies. Do you read a lot? We as musicians should have a philosophy to compose music. Maestro Khemadasa was one who had such strong philosophy inclined towards communism. With ‘Landune’ song he honored a prostitute and made the society to accept that. I was inspired greatly by him. This Samsara is a rotation and people who lived in ancient times may be living in present times too. We need to read the past lives of people to do justice to present context. Reading Devadatta, Maria Magdalena, Patachara or the like will guide a musician to make music scores in present day creations. I do that. History, philosophy and religion provide a wealth of knowledge to any music composer apart from music itself. Can a composer who lacks that knowledge send vibes among the society? A philosophical musician will live even after his death. Music is not meant to provide mere ‘fun’ and we as musicians should bear that in mind. Do you believe in your Rashi and written destiny of your life? The answer won’t be a firm ‘No’. Yet at one crucial stage in my life I got a blessing from some unknown force that brightened my life. I won awards at a time when the written destiny said otherwise. I believe any man can change his destiny with will power. There is another aspect to winning awards. Awards give us courage and motivation. But after winning those one should keep them aside and get back to basics. Adara Dadayama (ITN) and Devliya (Swarnavahini) are two tele-dramas to be telecast with my music scores. 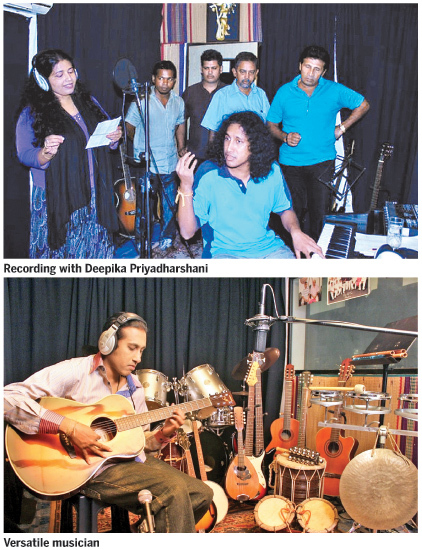 I compose music for Ranjan Ramanayake’s movie ‘Doctor Navariyan’. What else is in store for us from you in future? I aspire to connect music with spirituality and technology. There is no proper university in the world to teach how to stimulate vibes of a listener. I am training myself to conduct a spiritual musical concert in five years time. I believe music has been given to us by immortals. We take hold of only a limited frequency or range from this vast universe of music. But we humans have the capacity to grasp more. Apart from taking away stress and depression from people, music can do wonders. Healing is one such thing. Some voices are registered in the healing frequency. One such voice we have belongs to Dayaratne Ranatunga.